Why creating ritual for each transitional "life gates" matters. I recently learned a new term: liminality. It’s defined as a quality of ambiguity or disorientation that occurs in the middle stage of rituals. In today’s working world, it’s common for people to change jobs over a dozen times in their lives. And some can be significant career shifts, not lateral career moves. Yet many of us rush to the next “new thing,” never allowing us to feel complete and whole with our past. Let’s look at the first gate, saying goodbye to an old identity. When I work with clients who want to transform from legacy thinking to innovative thinking, I encourage them to kiss old projects goodbye in a playful way. These old, crusty projects no longer serve the organization. They are a drag on productivity. Customers no longer value them. Yet they occupy emotional and intellectual real estate. I encourage them to organize a “zombie killing party,” complete with a symbolic celebration. Few want to invest the time. Yet, these rituals give us permission to enter the second gate of liminality without excess baggage. The second gate of transition makes many of us uncomfortable. Yet it’s an important part of our career and human experience.I once befriended a woman in San Diego who parked herself squarely in this gate—for years. A vibrant 46-year-old real estate investor, she had the latitude and resources to pursue and experiment with myriad new career options. Yet she froze in the land of liminality, waiting for the perfect new career option to magically appear. For at least five years, it never did. The only way I’ve seen myself (and others) exit the second gate? To take a pause, and be comfortable there—for a time. The best career transitions I’ve seen happen when leaders declare a sabbatical period and honor it. One of my clients, a seasoned B2B CMO with decades of M&A expertise, did just that in late 2017. She helped a tech company get sold to a larger firm in Utah. Then she told several recruiters that she would take the next six months to enjoy her family and take on a part-time consulting assignment. She needed time to re-design her life and create a new role that would energize her. At the end of those six months, she landed three job offers. One emerged as the perfect new role, and she tells me that was well worth the wait. Her sabbatical was powerfully restorative and gave her a new perspective on what mattered most. By honoring our liminal time, we can then create our future and enter the third gate. We ensure our past doesn’t define nor limit our next adventure. Our slate is somewhat cleaner, ready for new memories to be made. Sometimes, I wish I could erase some of my old memories and jump directly to the third gate. Sadly, that only happens in fiction. Last week, I was relaxing with my cappuccino at Subculture Coffee, a quirky West Palm Beach Florida cafe. Liminality found ME when I came across a short story machine. 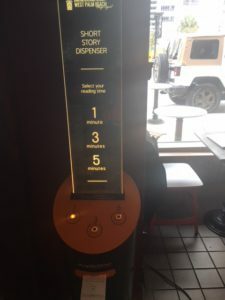 It allows you to download and print 1, 3, and 5-minute stories. What a perfect respite from social media and email! The machine spewed out the perfect story for me: “Basic Package” by Svetlana Kirlina. What memories deserve a final farewell ritual? How will you wipe your slate clean of regrets, and choose an exciting new road trip? Only liminality can offer the time and space to find answers. The price you will pay to skip this important period of ritual and restoration will cost far more than a moped.